The human immunodeficiency virus – better known today as HIV – was first recognised in the early 1980s, yet by 1995 a new class of antiretroviral (ARV) drug began helping patients. Each ARV class hits the virus on one of its life steps. A combination of different drugs keeps the virus in check and helps stave off resistance. There are dozens of ARV drugs in four main classes to impede viral replication, and HIV patients can now lead relatively long and healthy lives by taking ARV combinations, an astonishing achievement by medical science. ‘HIV therapy has been revolutionised over the last two decades. It has turned HIV from a death sentence into a manageable chronic disease,’ says Andrew Owen, a pharmacologist at the University of Liverpool in the UK. A downside is that patients must take ARV drugs every day. Present drug regimens are not easy on patients. Multiple ARVs must be taken. Many have low absorption, so the size of the pills can be substantial to make up for the losses. Some are 800mg tablets, veritable gobstoppers. ‘Only 40% of some drugs are absorbed into the bloodstream, so you have to give really large doses,’ Owen explains. Since patients must take the drugs every day, pill fatigue can set in and patients take ‘drug holidays,’ which allows the virus to rebound. Owen is working to alleviate this situation with his Liverpool colleague Steve Rannard, a polymer chemist. Their process makes drug nanoparticles, increasing the active agent’s surface to mass ratio, therefore increasing absorption in the body. This permits the dose to be reduced by up to 50%. ‘Reducing the dose means you’ve more flexibility to put more drugs into the one tablet,’ says Owen. Reducing the active ingredient can also cut costs, perhaps by up to 50%. The Liverpool team generate a solution with the ARV that could be freeze-dried and made into solid nanoparticles to administer to patients. The team has begun its first-in-man trial in HIV patients in the Chelsea and Westminster Hospital in London, UK, with two ARVs: Efavirenz and Lopinavir. ‘We’ve used spray-drying to mimic what happened in freeze-drying and that is scalable industrially, allowing us to make clinically relevant material,’ says Rannard. They are also working with the Medicine Patent Pool in Geneva, Switzerland, to license its intellectual property to a pharmaceutical company to deliver more efficient drug combinations in low- to middle-income countries. The goal is cheaper and less burdensome ARV drugs delivered as nanoparticles to a patient’s body. Beyond improving ARVs to manage HIV, there are new strategies to find a cure now being pursued by researchers, many of which either attack the virus with a gene slicer or improve a patient’s immune system. ‘Antiretrovirals are extremely effective, but the problem is they don’t cure,’ says Bryan Cullen, virologist at Duke University in Durham, US. ‘They repress the virus, but as soon as you stop taking the drug, the virus load returns to what it was before you started.’ HIV is an RNA virus in its free form: it enters host T cells after docking onto a surface glycoprotein called CD4 (and a co-receptor, CCR5). Once inside the cell, a reverse transcriptase enzyme flips viral RNA into DNA. The HIV DNA enters the cell nucleus and inserts itself into a patient’s own DNA. None of the current therapies can get at this stored HIV. ‘We and other groups have shown that you can cure HIV-1 infected cells in tissue culture plates very easily using Crispr–Cas, even destroying all the latent copies inside cells,’ says Cullen. A group led by Kamel Khalili at Temple University used Crispr-Cas9 to cut out HIV DNA from living mice that had been transplanted with human immune cells and infected with the virus.2 Cullen believes the strategy could work equally well against HIV in humans. But for this to work, first you must find the latently infected cells. By some estimates, just one in a million T-cells are silent HIV refuges. Delivering the necessary quantity of firepower is also a problem. Cullen estimates that perhaps a litre of concentrated lentivirus vector would be needed for an adult, to be sure to efficiently hit almost all infected cells. ‘That’s probably going to cause a strong inflammatory immune response,’ he adds. Recent research by Liang showed up another issue – he successfully inactivated HIV-1 using Crispr, but discovered mutations in HIV-1 at the binding site for the Cas9 protein, which would allow the virus to escape Crispr targeting.3 Finally, there is the issue of off-target gene editing effects. If you hit every memory T-cell in the body with a gene editor, there is a chance you could turn on a cancer gene or turn off a tumour supressor by accident. While this might be an acceptable risk in a cancer patient with an aggressive tumour, it would not be acceptable for most HIV patients. Another strategy seeks not to slice up HIV, but to edit a patient’s own cells so that they are no longer susceptible to the virus. The inspiration comes from one patient known to be cured of HIV. Timothy Ray Brown, aka the Berlin patient, received a bone marrow transplant in 2006 after his own immune cells were killed off by chemotherapy to treat his leukaemia. The donor had a rare type of stem cell, harbouring a mutation (CCR5-delta-32) that meant they were without the CCR5 receptor. The idea of gene editing is to take out a patient’s own T-cells and engineer them so that they do not have this HIV receptor. Earlier this year, the NIH awarded an $11 million (£8.5 million) grant to a team pioneering a similar approach. They will take T-cells out of 20 patients with HIV, gene-edit these cells and reinfuse them. 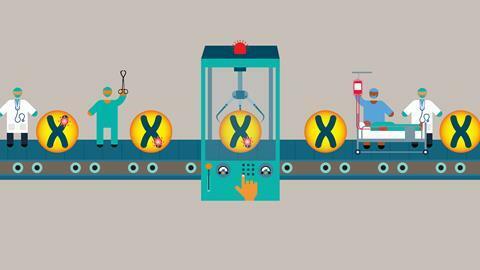 The editing will be done with zinc finger nucleases (ZFN) from Sangamo Therapeutics, an enzyme-based DNA editor that came before Crispr. The edit will disable the CCR5 gene, thereby removing HIV’s door into T-cells, leaving it unable to enter. ‘This system is minimally invasive. That’s the beauty of it,’ says Rafick-Pierre Sèkaly, an HIV researcher at Case Western Reserve University in Cleveland, US. White blood cells are taken from patient’s blood over a period of two to three hours. The CD4+ T-cells are edited to remove CCR5 using the ZFNs and grown up in the lab for 12 days. 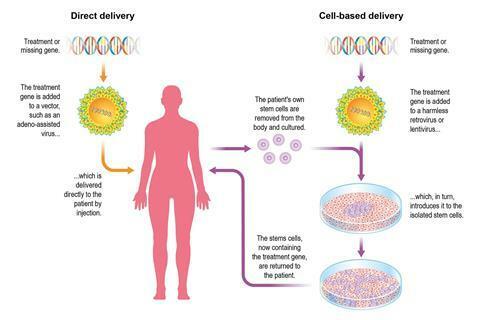 The patient then receives T cells endowed with properties of stem cells that are resistant to HIV and are ready to spawn daughter cells that will take the fight to the virus. ‘We’ve shown that over the course of two to three years, over 70% of T-cells are being replaced in such patients. This is a huge advantage,’ Sèkaly explains. ‘Infected T-cells don’t live forever and we are replacing them with ones that cannot get infected.’ He says the patient’s immune system is then more competent. It will set about its task of killing any cells that are releasing HIV. ‘77 patients have received the treatment over the past five years and there have been no drop-outs due to adverse events. We don’t expect any [in the forthcoming trial],’ says Sèkaly. ‘I think this can really lead to a cure. We haven’t proven that, but we are on that road,’ he says. He believes a second injection after two years, using the same cells, could help provide the coup de grâce for a patient’s HIV infection. One quibble is the money. Right now, Sèkaly reckons it costs perhaps $25,000 per patient, a price that can come down significantly. Others are not so sure cellular therapy is the right direction to travel. ‘If we are talking about engineering and reinfusing cells, that kind of therapeutic is not going to be feasible in sub-Saharan Africa. We cannot settle for that, or we’ll be abandoning those people HIV is hitting hardest,’ warns Greene. Nonetheless, there is a significant fraction of HIV patients who are on retroviral medicines and who suffer significant side effects, especially neurological conditions. Since ARV are not a cure, researchers must plough forward and continue to seek strategies that might defeat the virus. Recently, cancer patients have had immune cells extracted and refitted with chimeric antigen receptors (CARs), docking sites that are designed to target cancer cells. This strategy is now being tried for HIV, with scientists engineering T-cells to carry a hybrid receptor designed to detect and kill HIV-infected cells. The HIV-recognising CD4 docking site is included in the CAR molecule and used to signal the presence of a HIV-infected cell. A team led by Scott Kitchen at University California, Los Angeles, in the US reported how they modified stem cells to continuously produced T-cells that carried a CAR. In humanised mice, T-cells with the hybrid antigen became resistant to HIV infection and also supressed its replication.4 They subsequently showed that stem cells, infused into pig-tailed macaques, engrafted into their bone marrow and started producing daughter cells to target HIV.5 ‘These cells engraft for the lifetime of the animal and will produce T-cells and other cells to attack HIV. There were no adverse events or toxicity,’ explains Kitchen. The strategy did not eliminate infection, but had a protective effect against HIV. The approach has history. Trials in the late 1990s by Cell Genesys, a gene therapy company, engineered CD4 and CD8 T-cells. The therapy directed T-cells against HIV and went through three clinical trials. Unfortunately the clinical impact was modest, says Kitchen, partly because the changes made CD8 killer T-cells susceptible to HIV. ‘We corrected the approach by genetically modifying the cells so that they are protected from HIV infection,’ says Kitchen. This was done by introducing a gene to make RNA that interfered with the expression of HIV CCR5 receptor, and by introducing a gene that makes a small peptide that can bind to and stop the virus fusing to patient cells. ‘In addition to the chimeric antigen receptor, the two antiviral genes protect the cells themselves from being infected,’ Kitchen adds. The idea is to take stem cells from a patient, engineer them to be resistant to HIV, then engineer them to target HIV and to reinfuse them back to the patient, where they permanently engraft into their bone marrow. ‘They would then continually produce cells capable of targeting HIV throughout their lifetime,’ Kitchen explains. He admits that cost is an issue, but is optimistic that the approach can ride the CAR-T wave in other areas, such as cancer. ‘It could be millions or hundreds of thousands of dollars for the first few patients,’ he says. ’But the approach is being worked on in other areas right now and it is realistic to expect the costs to fall significantly.’ He hopes that a one-time injection could cure a HIV-infected patient, in a way that would be cheaper that a lifetime of ARV therapy now. One strategy for attacking the latent reservoir is termed ‘shock and kill,’ which is a one–two combo intended to knock off those cells harbouring latent virus. Earlier this year, Gilead reported using a toll-like receptor stimulant to rouse HIV from its rest in infected cells by turning on its intrinsic gene expression machinery, and then killing the infected cell by adding an antibody recognizing a key HIV protein expressed at the cell surface (PGT121). In macaques, five out of 11 animals went 168 days without seeing a rebound in their simian immunodeficiency virus load after the therapy. Gilead is now moving towards first in man trials. One other hurdle is that many of the replicates are defective, and perhaps only one in 1000 will actually give rise to a new infection. Nonetheless, researchers such as Sèkaly believe a cure to HIV infection is on the cards and will involve modifying a patient’s DNA so that their cells better withstand HIV itself, and seek and destroy the virus whenever it emerges. ‘We can use antiretroviral therapy to keep down the numbers of virus, but also give the immune system the ability to control whatever remains,’ he says. Antiretrovirals have been a tremendous success for HIV patients. The stage is set for the next significant advance, though who will be cast in the lead role is not yet clear. There are at least many exciting prospects.